On Tuesday, TSN’s Bardown website posted a blog about a survey that some Reddit users had conducted asking hockey fans throughout the world to name their most hated hockey team. The results were grouped by Canadian provinces, American states, and continents world-wide. The findings were amusing if not unsurprising. For instance, the Boston Bruins are the most hated team in North America, Europe, Asia, and Australia. For reasons unbeknownst to me (aside from possibly small sample sizes), the Montreal Canadiens are the most hated team in South America, while the Winnipeg Jets (?!?) are the most hated team in the hockey hotbed of Africa. When it came to the USA, there was a good amount of hatred for the Bruins, Blackhawks, Red Wings, and Kings. 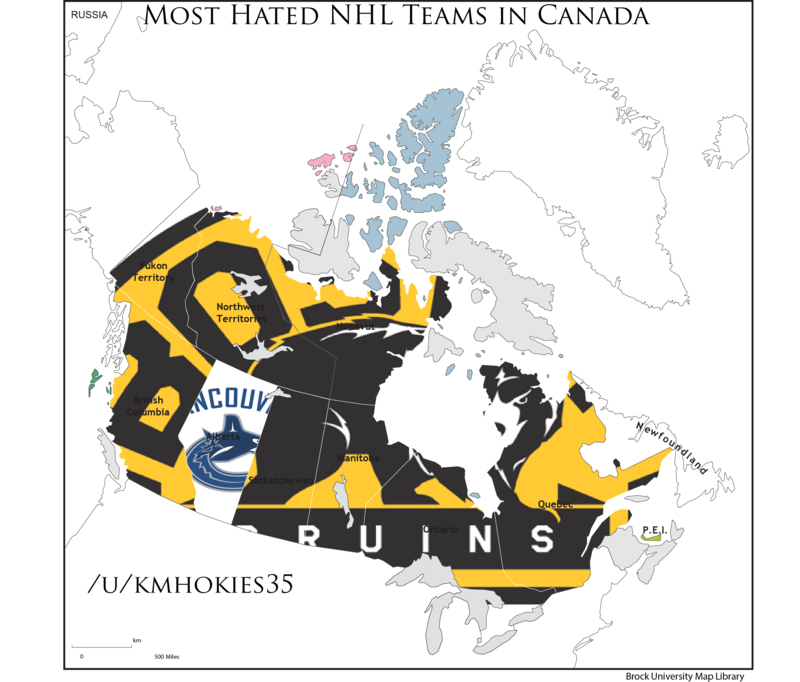 And for Canada, every single province and territory polled listed the big, bad Bruins as their most hated team. That is, except for Alberta. Our immediate neighbours chose the Vancouver Canucks. I had my own theories why but I went to the Twitterverse to get some more opinions. Thus, we proudly present to you the Top 10 Reasons Why Albertans Hate the Vancouver Canucks. 4. The Canucks have better bloggers. I guess I do. Well, enough to write a whole blog about it. I think it’s got to be #4. But I may be biased…. I`ll go with number 1 . Alberta is the irritable bowel syndrome of Canada . The Alberta *cough*, teams have been largely irrelevant for so long who cares what the northern Texans think. In BC, I am guessing the flames and oilers were tied. But that would be mostly that they have been dreadfully bad. I think of it as the tight A$$ well off sibling that lives in the suburbs of well…..alberta. Looking over the fence at their sibling b.c. who has beaches, mountains, winecountry, weed, microbrews, culutre … And above all else a winning hockey team. I bet they feel but hurt. the shift. i could watch that every day. i doubt that’s the reason, although it makes up a number of the other reasons, right? Stick in Link: Next year’s Canucks, now with more prospects and coaches!